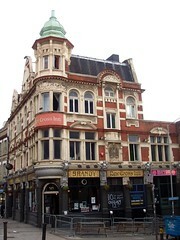 Pub in New Cross, an occasional live music venue. It's either also known as Bar Alchemy, or was called Bar Alchemy for a while before going back to being the New Cross Inn. An RGL posse visited on a Sunday evening in November 2007 as part of the East London Line Pub Crawl. It was dimly lit and pretty empty when we were there (around 8pm-ish). Very few tables and chairs considering the amount of space, so it's likely mostly used for vertical drinking, or live music, or both. While we were there, a man wandered in off the street and started trying to have conversations with us and the other customers, but he seemed a bit drunk and eventually went away again. There was music, but it seemed suitable for the surroundings, and didn't get too loud until a DJ appeared around 9pm shortly before we had to leave for the next pub. The interweb says they do Chinese food, but there is no sign of food available. There's also no real ale. Ewan comments: On a visit in March 2008, we asked the lady behind the bar whether we could bring in food and they were fine with that; in general she was very friendly despite their card machine failing to work (which delayed one of my drinks orders by quite a few minutes while other patrons tried to use their cards). On that visit, bar staff were very friendly and the music was not too loud, but eventually (around 9pm) a rather confusing male member of staff asked to take our table, which was by the door. It wasn't clear exactly why he wanted to take it and he didn't bother to remove the headphones from his ears when addressing us, but we finished our drinks and left. It would appear that they start getting very security-conscious later in the evening, what with this being the main drag of New Cross rowdiness. The house red wine was very drinkable, which is just as well since there was no ale option. Last visited by Ewan, Bec and others, 11 March 2008. Opening hours taken from the New Cross Inn MySpace page, November 2007. Last edited 2012-09-28 21:45:01 (version 10; diff). List all versions. Page last edited 2012-09-28 21:45:01 (version 10).